ANKARA, Turkey — Turkish officials said Thursday that U.S. Defense Secretary Jim Mattis has written to his Turkish counterpart, reassuring him that arms provided to Syrian Kurdish fighters would be taken back once Islamic State militants are ousted from their main stronghold in Syria, the city of Raqqa. Turkish Defense Ministry officials said in a statement that Mattis also reassured Defense Minister Fikri Isik that the United States would regularly provide Turkey with a list of arms provided to the fighters while U.S. military advisers on the field would ensure that the arms don't go outside of the Syria battle zones. 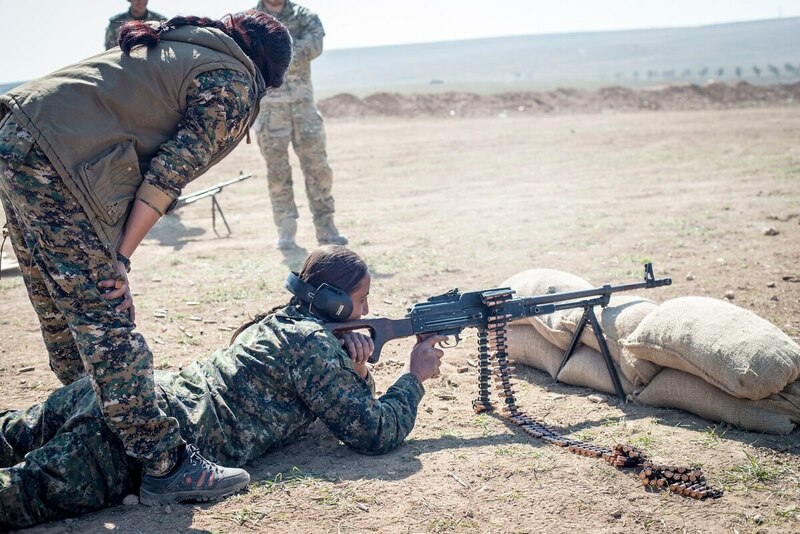 A U.S. decision to launch an offensive to capture Raqqa in partnership with the Kurdish-led Syrian Democratic Forces has complicated relations with Ankara, which views the group's Kurdish fighters as an extension of an insurgent Kurdish terror group operating in Turkey. Ankara fears arms provided to the Kurdish fighters will end up in the hands of the insurgents in Turkey and has threatened to respond to threats. The officials said Mattis told Isik in the letter that 80 percent of the force which would capture Raqqa would be made up of Arabs and that an Arab force would hold the city. If confirmed, Mattis' statement on the weapons being taken back once the Raqqa fight is over conflict with recent comments made by officials of the U.S.-led coalition against ISIS. The coalition's spokesman at the time, Col. John Dorrian, said last month that the weapons supplied to the Kurds will not be reclaimed by the U.S. after the specific missions are completed, but that the U.S. will "carefully monitor" where and how they are used. 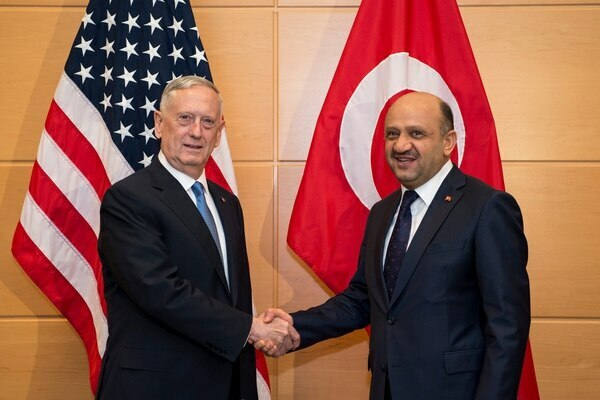 Secretary of Defense Jim Mattis meets with Turkish Minister of National Defense Fikri Isik at the NATO Headquarters in Brussels, Belgium, Feb. 15, 2017. In Russia, a senior lawmaker said Moscow is negotiating with two Central Asian nations about sending their troops to monitor a cease-fire in some areas of Syria. State-owned RIA Novosti news agency on Thursday quoted Vladimir Shamanov, head of the defense committee at the State Duma, as saying that that Russia has asked Kazakhstan and Kyrgyzstan, two former Soviet republics, to send their troops to Syria where Russia is backing President Bashar Assad. Shamanov said no firm decision has been made yet. Russia's envoy to Syria earlier said Russia and Iran would send their troops to monitor "de-escalation zones" in Syria and that other countries might join them there. In Turkey, a senior official said Russia has proposed deploying troops from Kyrgyzstan and Kazakhstan to Syria, to monitor de-escalation zones there. Ibrahim Kalin, spokesman for President Recep Tayyip Erdogan, also told a group of reporters that Russia and Turkey may send their troops to monitor a zone in the northwestern province of Idlib. Russia and Iran would monitor another zone near Damascus while the United State and Jordan would observe the southern province of Daraa, Kalin said. His words were carried by Hurriyet newspaper's online edition on Thursday. A "de-escalation agreement" brokered by Iran, Russia and Turkey in May covers four zones in Syria where the rebels are fighting pro-government forces. Meanwhile, French President Emmanuel Macron has said that France is no longer pushing for the departure of Syrian President Bashar Assad, in a shift in French policy throughout the Syrian war. Macron said he wants to work more closely with Russia for a solution in Syria and says foreign powers were too focused on Assad as a person. "For a long time we were blocked on the persona of Bashar Assad," Macron said in an interview with eight European newspapers published on Thursday. "Bashar is not our enemy, he is the enemy of the Syrian people." Macron also said that foreign powers "collectively committed an error" in focusing on a military solution in Syria. "The new outlook I have on this issue is that I haven't stated that Bashar Assad's departure is a necessary condition for everything. Because no one has shown me a legitimate successor," he said. Macron's predecessors were among the most vocal Assad opponents. However, Macron warned France would attack Syria if the government uses chemical weapons. French warplanes are already targeting Islamic State extremists in Syria.